The Elizabethtown American Legion Post No. 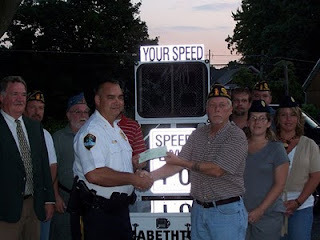 329 donated nearly $5,000 to the Elizabethtown Police Department to buy a "speed trailer." The trailer contains radar and a sign that posts a car's speed as it drives past the trailer. Police Chief Jack Mentzer said officers won't use the trailer for enforcement but rather to inform and educate drivers "about how easy it is to go above the speed limit and not notice it." "It's a fabulous tool to have," he said. Ken Stark, commander of Post No. 329, said once someone brought up the idea of purchasing the trailer, everyone at the Legion contributed. "We all worked together to make it work," he said. I join Mentzer in thanking the American Legion for its contribution. Municipal budgets are traditionally lean, and for a small police department such as Elizabethtown's a speed trailer traditionally falls onto a wish list. Mentzer said it's something the department has wanted for years but wasn't a priority. Now the Legion's support is helping to make driving in Elizabethtown a little safer.